For the 45th year, hundreds of thousands of Americans flooded the nation’s capital for the annual March for Life, calling for the end of the slaughter of innocents through the sin of abortion. 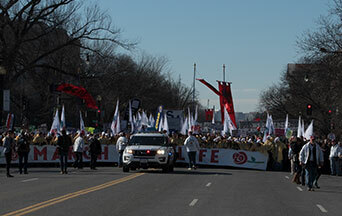 Members of the American Society for the Defense of Tradition, Family and Property (TFP) united with so many others in the march for the end of the Culture of Death. The beating of drums and clash of cymbals, trumpet fanfares and the captivating sound of bagpipes rang throughout the crowded streets of Washington. 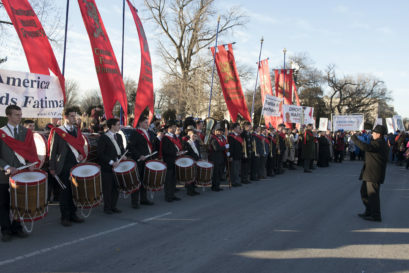 The music performed by the American TFP’s Holy Choirs of Angels Band helped give an upbeat and determined attitude to the resolute pro-life warriors marching. 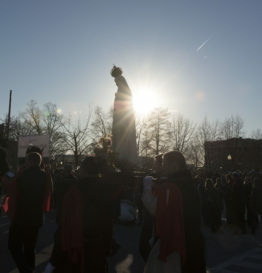 Showing their support, foreign delegations from sister organizations of the American TFP joined the march including Droit de Naître (France) and Krikščionškosios Kultūros Gynimo Asociacja (Lithuania). Among the notable guests was Duke Paul of Oldenburg from Aktion SOS Leben (Germany). This entry was posted in Events of 2018, Fighting the Culture War, In Defense of the Unborn and tagged abortion, confidence, hope, March for Life 2018, President Trump, pro-life, right to life, Trump by William Gossett. Bookmark the permalink.